Heel Chemistry contains an extraordinary 19.5% active ingredients. Our Antarctic Marine Complex increases skin health and moisturisation, showing a significant increase of skin hydration of 90% in 14 days. Calendula provides a healing and regeneration effect for both immediate and long-lasting results. Our active complex includes: Pseudoalteromonas Complex, Tremella Fuciformis, Purified Calendula Extract, Hydracool and Maize Propanediol. Apply twice a day to dehydrated areas for 14 days. Continue application as needed. 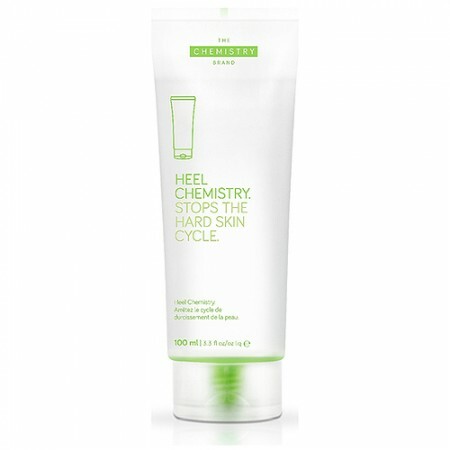 Can be used on heels, hands, elbows and other areas suffering from extreme dryness. Aqua (Water), Propanediol, Caprylic/Capric Triglyceride, Cetearyl Glucoside, Cetearyl Alcohol, Cyclopentasiloxane, Cetyl Alcohol, Glycerin, Alanine, Proline, Serine, Tremella Fuciformis Sporocarp Extract, Pseudoalteromonas Ferment Extract, Calendula Officinalis Flower Extract, Glycine Soja (Soybean) Oil, Tocopherol, Betaine, Dimethicone/Vinyl Dimethicone Crosspolymer, Acrylates Copolymer, Sodium Polyacrylate, Hydroxypropylcellulose, Cellulose, Xanthan Gum, Menthol, Menthyl Lactate, Methyl Diisopropyl Propionamide, Ethyl Menthane Carboxamide, Propylene Glycol, Sodium Phosphate, Sodium Hydroxide, Potassium Sorbate, Ethylhexylglycerin, Caprylyl Glycol, Phenoxyethanol, Chlorphenesin, Parfum (Fragrance), Limonene, Linalool. The Chemistry Brand formulations are updated from time to time as part of our commitment to innovation. As such, the ingredient list shown here may vary from the box of the product depending on time and region of purchase.